Aaron Monaghan, who saw Trad when it premiered at the 2004 Galway Arts Festival. Aaron Monaghan, who is familiar to Galway theatre audiences for his many superb performances with Druid Company, returns to the Mick Lally Theatre from next Thursday to Saturday, April 25- 27. This time, he’ll be behind the scenes, directing a fine cast in a new production of Mark Doherty’s poignant comedy, Trad. Trad premiered at Galway Arts Festival in 2004 before going on to win a Fringe First in Edinburgh in 2005 and one in Adelaide the following year. Trad is the story of a 100-year-old man and his father who live in a remote Irish townland. Da (played by Emmet Kirwan) berates Son (Seamus O’Rourke) for failing to provide a son to continue the family line. But Thomas has a secret that goes back 70 years to an unforgettable night of passion with Mary. That night provided very thing his Da is seeking . . . Together, they set out to discover Son’s son and, along the way, they encounter two other characters, Fr Rice and Sal, both played by Galway woman Clare Barrett. 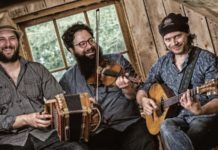 This production of Trad is being presented by Livin’ Dred, the Cavan theatre company, which Aaron – a native of that county – helped to establish in 2004 “to give people a good professional play without them having to travel to Dublin to see it”. Cavan, like many rural counties, has a great tradition of amateur drama and with Livin’ Dred, Aaron Pádraic McIntyre and Mary Hanley wanted to offer them professional shows too. Livin’ Dred is based in the Ramor Theatre in Virginia and this is Aaron’s first time directing for the company, having recently taken on the role of its Artistic Director. “I saw Trad years ago in Druid and loved it. And for my first outing as Artistic Director with Livin’ Dred, I couldn’t think of anything else I wanted to direct more,” he explains.